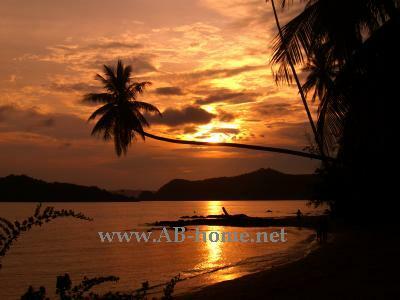 Koh Mak is a small tropical Island of the Koh Chang Archipelago in the Gulf of Thailand. Maak Island is 16 square kilometer in sice and have about 500 habitats. The locals living from Rubber / Coconut Plantation, Fishing and more and more from the Tourism on this cosy Island in Southeast Asia. 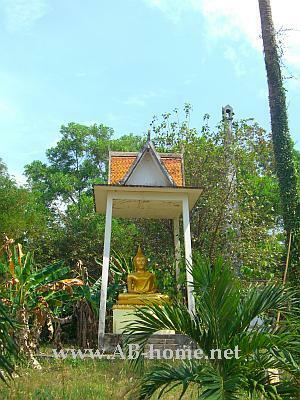 Compared to other Islands in Asia and Thailand is Ko Mak really quiet. The less developed streets are widespread, it’s beautiful to drive threw tight Coconut and Rubber trees. I was here in the beginning of March 09. We stayed at the Ao Katueng Beach in the north-west of Koh Maak. Moun and I rent a Motorbike at the Monkey Island Resort to explore “the pearl of Thailand”. First we went to Ao Tokai in the north of Koh Maak. On the way we visit the ruins of the “Love Temple”, the “local Handycraft sculpture” and Ao Suanyai Beach. 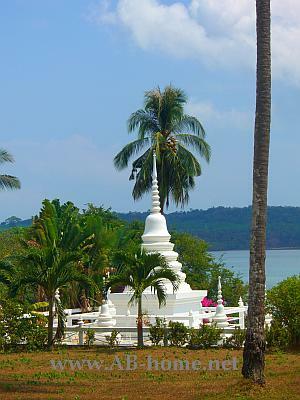 Near the Pier at Suanyai Bay we drank a fresh Banana Shake at Coffee shop “Orchid” next to Koh Maak Resort. Than we drive to the Northeast and rest on the Lonely Ao Talong Beach. From there we go over Ao Taan to the East end and drank a cold Water at the “Little Moon Resort”. We drove thrue tight Rubber Plantages to the Temple of Koh Mak near Ao Nid Pier. Here we stopped to pray and enjoy the nice view over the warm water of the Gulf of Thailand. Direct on the pier you can visit the Ko Mak History Museum. Our next destination was the “Smile Cooking School” to visit a friend who live before at Klong Prao Beach on Koh Chang Island. On the way we saw a nice white Paragon direct on the sea. Here are the graves of the five brothers who owned before the hole Island. We Travel atlong the Laem Chan Beach to “Cafe del Mak” for some refreshments. On this evening we eat some yummies Thai Food at Baan Sabaay Restaurant close to our Resort at Katueng Beach. We enjoyed Koh Mak, it’s a quiet Paradise Island with many flair. The Beaches are lonely and long. The Coconut Palms stop nearly where the warm water start, like in Paradiese! The Pearl of the Gulf of Thailand offer a great location for all who like to chill and relax at holidays. There are some options to go out in the evening, some bars on the beach have Life Music, fire shows or a nice view for the colorful Sunset behind the hills of Koh Mak Island in Thailand. If you want to go diving there are three Scuba Schools on the tropical Island. Ploy Scuba, Koh Maak Divers and Paradise Divers offer Padi Courses and Fun Dive Day Trips around Ko Maak at the Mu Koh Chang National Park. This protected area are famous for many kind of colorful Marine Life and huge Fish Schools. Paradise Divers offer as well CMAS courses in the warm water of the Gulf. We enjoyed our holidays on Koh Mak in Thailand’s Trad province. Thanks to the friendly people of Koh Mak Resort and all other who make our time there to a unforgettable holiday highlight in Southeast Asia.